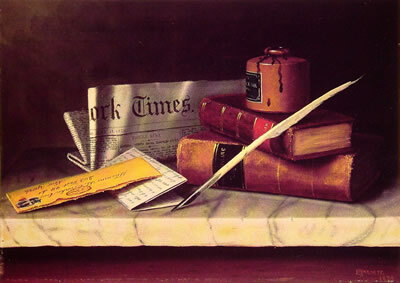 Still Life with Letter to Thomas B Clarke, by William Michael Harnett. These keepsake things I so adore. It's such a happy list you'll see. All angers and hurts that came before. My mother passed this on to me. And my father's death the rhyme restores. Of letters and pictures in a drawer. My mother passed them on to me. all ache and anger and nothing more. Willam Lychack is author of a novel, The Wasp Eater, and a collection of stories, The Architect of Flowers, both published by Houghton Mifflin. His work has appeared in The Pushcart Prize, The Best American Short Stories, and on public radio's This American Life, as well as in current or recent issues of The American Scholar, Ploughshares, The Missouri Review, Third Coast, The Sun, and The Southern Review.